Signal light: T. Woofenden Collection. Photo of light on chaser: G.S. Dole Collection. 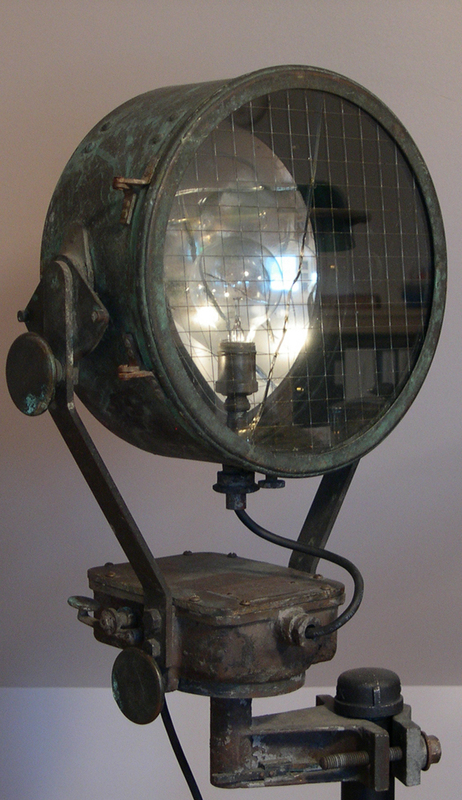 This is the model of signal light used on the submarine chasers in WWI. The diameter of the front face of the light is 12-3/4", and the overall depth of the head is about 7-1/2". The junction box below the head contains a capacitor. The light was operated by the spark key on the box. Loosening a set of thumb screws allows movement for aiming and focus: The light rotates on the mount below the junction box; it pivots up and down on the bracket that holds the head; and the light bulb receptacle moves forward and backward along a slot to position the bulb at the right spot for the concave mirror behind the light to focus the beam on the target. Notes: The original glass was clear, not wire-reinforced. Also, in photos of the light on chasers there is generally a scope attached to the light, off-center on the top. This light has been re-wired for 110V for display. The light receptacle itself may or may not be original; the bulb is new. The painted-black mounting post is new, for display. 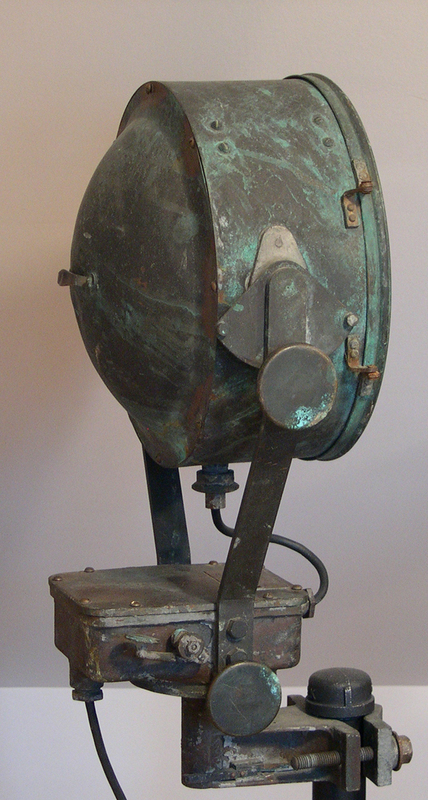 WWI signal light. On the chasers the light was mounted directly to the top of a post, not clamped to a pipe with the pipe clamp assembly shown here. Junction box containing battery. Spark key on the side. The vertical disk is the thumb screw for fixing the rotation position of the light head. 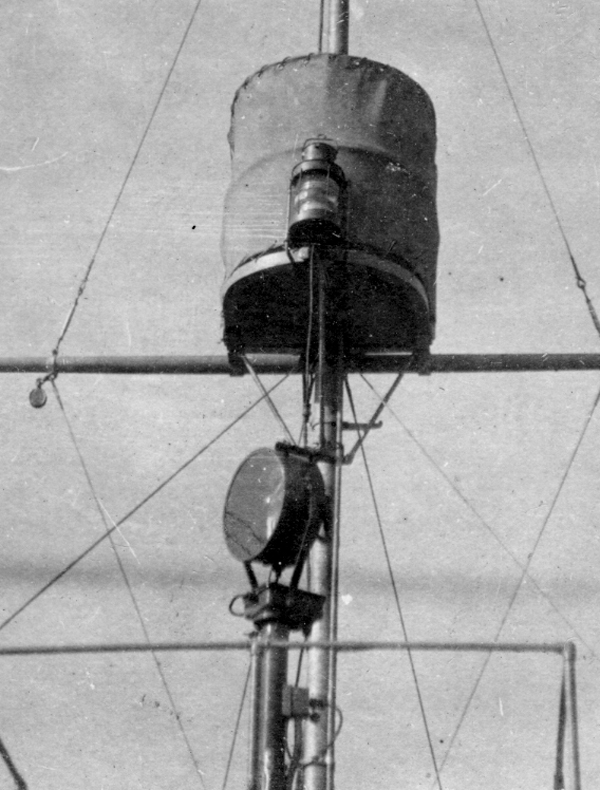 Signal light on WWI chaser, mounted on the flying bridge. Note: This perspective might suggest that it is mounted up high, but note the pipe railing forward of the light (shown without the typical canvas cover). The light was mounted at a correct height for a man standing on the flying bridge to operate it efficiently. Note the scope mounted left of center on top.